This book can be the least expensive part of your move planning and one that brings you the greatest return. Widely acclaimed as the definitive relocation handbook for families on the move, it covers every aspect of moving a family or single person. Written in the sequence events will occur, it will help the move go more smoothly. 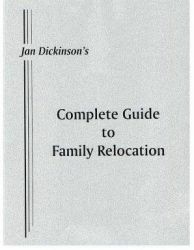 "Based on years of relocation experience and interaction with families on the move, Jan Dickinson has written a very complete handbook for the relocating employee and family. In a conversational manner, Jan addresses, in considerable detail, the many events that will be taking place and the decisions that must be made as a result of the move. A detailed table of contents permits the employee to quickly identify those sections that pertain, and that may provide the answer to a question that has arisen. Jan emphasizes the various support systems that are available to the employee, including the corporate relocation administrator/coordinator and the experienced real estate agent who can provide invaluable information to allow the family to do their "homework" ahead of time to better utilize the time spent on the homefinding trip. Jan provides endless suggestions on how to make the trip to the new location more bearable for everyone (including games and relaxation exercises that can be done in the car, traveling by air with infants, safety, security, and health tips), how to orchestrate a successful "pre-move" garage sale, how to say good-bye to friends and neighbors (adults and children), and how to relocate pets. For the individual with a real fondness for plant life, Jan shares several options for "transplanting" them - donating them to hospitals, libraries, etc., giving them to special friends as "remember me" gifts... or, if these options are unthinkable, how they may be packed for travel or shipping and the various inspections they may be subject to, depending on the part of the world to which the employee is moving. Helpful household goods inventorying, packing, and color-coding tips also are included, along with criteria to consider in selecting a moving company and a review of the services that should be expected and can be requested of the carrier. Several sections pertain to the real estate transactions. The author builds in "subtle psychological supports throughout," referring to the residence at the old location as "house" and at the new location as "home." In areas such as the house sale, financing, building, home purchase, capital gains, and various tax aspects, the employee is familiarized with the language and terms that will be encountered and provided with checklists, guidelines, and questions to post to real estate agents, mortgage companies, building contractors, tax accountants, etc. In addition, Jan provides direction to the spouse that may be seeking employment at the new location, laying out, in an orderly fashion, the steps that should be followed - defining objectives, creating a resume, preparing a cover letter, researching the job market, preparing for the interview, etc. Other sections of the book are dedicated to the relocating single person, international moves, and settling in at the new location. The book is appropriately named and could be an invaluable handbook for the transferring employee and family. It holds many checklists and guidelines for pre-move/early move events. The employee would best benefit by receiving the book as early in the process as possible - while there is still time to read it and begin pre-move research and homework that will make the entire relocation process much smoother and less stressful on all parties involved."